This Spotlight features a range of DRK-12 projects that work with preservice teachers in STEM disciplines. These projects are working in cities around the country to design, implement, and/or study teacher preparation programs. Learn more about the impact of these innovative models on preservice learning and teaching. Profiles of three featured projects offer details about their preservice models, the key challenges the models were designed to address, research questions, and emerging findings from the project work. For information about other DRK-12 projects working with preservice teachers, see the additional projects section below. The American Museum of Natural History (AMNH) has designed, implemented, researched, and evaluated the first five years of its museum-based Master of Arts in Teaching Earth Science Residency 7–12 program (AMNH MAT). The AMNH MAT is the first museum-based program in the U.S. that leads to the Earth Science 7–12 Initial/Professional Certificate in New York State (NYS). The program is in its sixth cohort of participants and has graduated 78 residents in its first five cohorts. The program is made possible through a NYS Race to the Top competitive innovation grant and there are multiple innovative features of the program, beginning with its location at AMNH. The program continues to grow with innovative design features, such as partnerships between the Museum’s education and science departments and partnerships with four residency public schools. Read more. The AMNH MAT was designed to address the critical shortage of certified Earth science teachers in New York State and, in particular, New York City. Earth science has been a longstanding area of need, with shortages reported as far back as 1999 (U.S. Department of Education, 2014). During the 2010–11 school year, 39 percent of New York City Earth science teachers were not certified to teach in the area (NYSED, 2012). More broadly, as of 2006–07, 6.5 percent of science teachers in New York State and 16.5 percent of science teachers in New York City were not “highly qualified.” And as of 2011, the turnover rate of New York City science teachers was 6 percent compared to 3 percent for New York State—additional indicators of need (NYSED, 2011). For these reasons, the NYS Regents, through NYS Race to the Top innovation grants, offers the opportunity for institutions outside traditional teacher preparation institutions to submit for competition designs that respond to areas of high need. Read more. Key questions were designed to assess the program impacts in four different areas: 1) impacts of the program on the preparation of beginning Earth science teachers; 2) impacts of the program’s teacher graduates on the performance of their students; 3) impacts of the program on partnership schools; and 4) impacts of the MAT program on the Museum and its faculty and staff. Read more. To date, the AMNH MAT Earth Science Residency Program has prepared 78 teachers certified to teach Earth science and middle school science in high-needs schools in New York State. 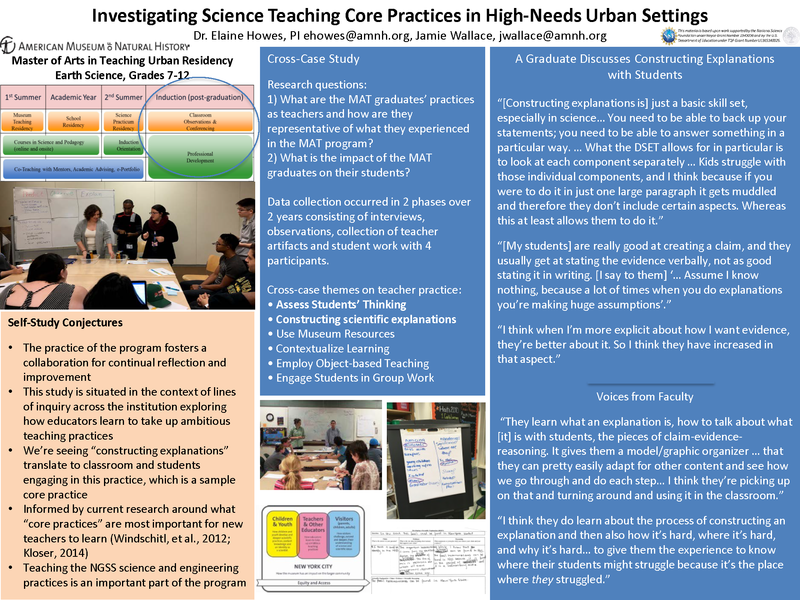 Findings from our first two cohorts of graduates indicate that AMNH MAT’s retention rate is on par with, and even exceeds, the average retention rate reported by residency programs; it is certainly far above the national average for teachers prepared across all programs working in high-needs schools and teaching in subject areas for which there are teacher shortages. Read more. 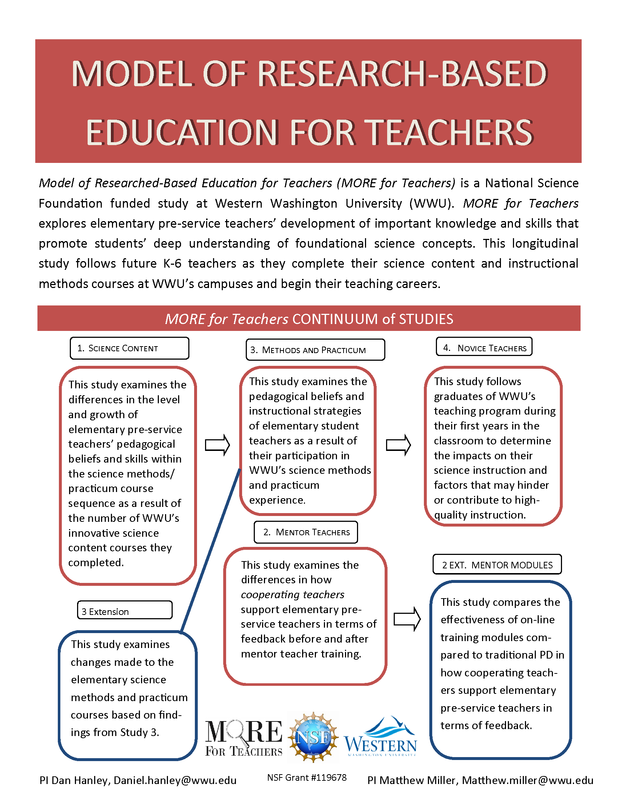 The MORE for Teachers project developed and studied a professional development (PD) program to help elementary teachers effectively mentor preservice teachers in science. 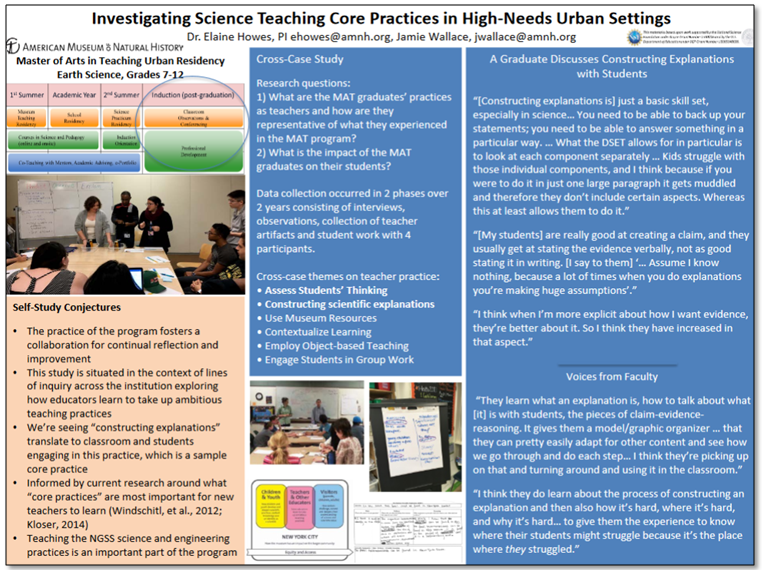 An innovative aspect of the PD was that it was couched within the context of an elementary science practice course. The PD was specifically designed to increase cooperating teachers’ understanding of research-based elements of effective science instruction (Banilower, Cohen, Pasley, & Weiss, 2010), and develop their skills with facilitating learning-focused mentoring conversations (Lipton & Wellman, 2007) around the elements of effective science instruction. The effective science instruction framework and learning-focused conversations were both “student-centered”, and focused teachers’ observations and subsequent mentoring conversations on the extent to which the elementary students developed their understanding of the learning targets for the lessons and the factors that contributed or inhibited student learning. Read more. Teaching science is a “complex, knowledge-intense undertaking” (Darling-Hammond, 2006, p. 301) that requires preservice teachers to bring together substantive understandings of science content and teaching pedagogy to support students’ learning (Smagorinsky, Cook, & Johnson, 2003). In order to support the complex process of learning to teach science, there are currently calls to increase opportunities for clinical practice in teacher preparation (Darling-Hammond, 2014; Field & Scoy, 2014; Goodwin, Roegman, & Reagan, 2016; Guha, Hyler, & Darling-Hammond, 2016; McDonald et al., 2014; NCTR, 2015). While cooperating teachers are uniquely positioned to support the clinical experiences of preservice teachers’ professional growth, the expertise they bring to mentoring candidates varies widely. Read more. 1) To what extent did the MORE for Teachers PD program increase cooperating teachers’ beliefs about effective science instruction and the quality of mentoring conversations? and 2) To what extent did participating in learning-focused mentoring conversations increase preservice teachers’ beliefs about effective science instruction? We studied the impacts of the MORE for Teachers mentoring PD using a one-group, repeated-measures quasi-experimental research design (Shadish, Cook, and Campbell, 2002) that included pre/post-surveys of mentor teachers’ beliefs about effective science instruction, using the Teachers’ Beliefs about Effective Science Teaching (TBEST) survey (Smith, Smith, & Banilower, 2014). A paired-samples t-test between pre- and post-survey scores showed statistically significant increases (p<.05) in teachers’ beliefs about effective science instruction. Read more. 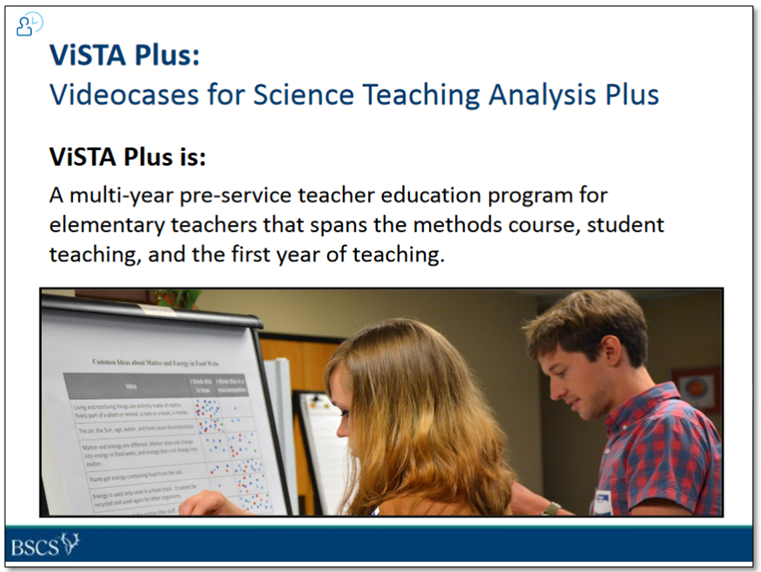 ViSTA Plus is a unique multi-year preservice teacher education program for elementary science designed around three fundamental principles: 1) Teacher preparation should focus on the key skills and practices that will make a difference for student learning; 2) Learning to teach science is most effective if it is focused on real classroom situations; and 3) New teachers need a supportive environment to grow their knowledge and understanding of effective science teaching. Read more. As new teachers brace for the inevitable chaos of their first year in the classroom, hoping to maintain a sense of order, it’s easy to get sidetracked from what really matters—advancing student learning. In the ViSTA Plus program we learned that elementary teachers are eager and successfully able to develop effective practices, even as they are struggling with the challenges of first-year teaching. Often, elementary teachers are daunted by the prospect of teaching science because of their own lack of content knowledge or negative experiences with science learning. In addition, preparing elementary teachers to teach science is frequently given a low priority amidst all the various topics needed for certification. Read more. 1) What gains do teachers in the ViSTA Plus program and “business-as-usual” program experience in science content knowledge, pedagogical content knowledge (PCK), and science teaching practice? and 2) What gains do elementary students of teachers in the ViSTA Plus and “business-as-usual” groups experience in knowledge of science content? Teachers in the ViSTA Plus group had significantly higher gains on all outcomes than students in the business-as-usual (BAU) group. These differences were evident at the end of the methods course, and were still present at the end of the student teaching experience. The effect sizes between the ViSTA Plus and BAU groups are shown below. Students of student teachers in both the ViSTA Plus and BAU groups increased in their understanding of grade-level science concepts. However, the students of preservice teachers in the ViSTA Plus group had significantly greater gains after instruction, effect size = 0.38, p<.01. Read more. 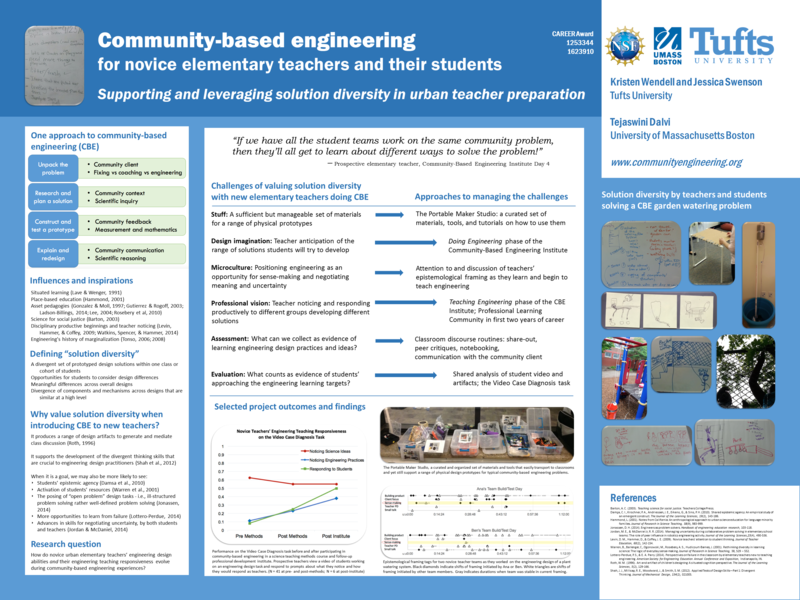 Project description: This project is aimed at developing, implementing, and assessing a model that introduces novice elementary school teachers (grades 1-6) to community-based engineering design as a strategy for teaching and learning in urban schools. Reflective of the new Framework for K-12 Science Education, the model addresses key crosscutting concepts, disciplinary core ideas, and scientific and engineering practices. It builds on theoretical perspectives and empirical foundations, including situated learning, engineering design cognition, and children's resources and funds of knowledge, including cultural and linguistic diversity. 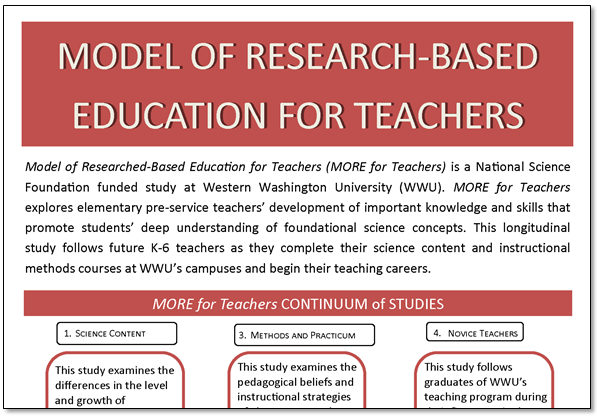 The study integrates research and education plans that investigate the short-term impact of the model on 90 novice teachers' learning through their preservice coursework and practice teaching, and its longer-term impact on a subset of 48 of those teachers as they begin their first year of in-service teaching. 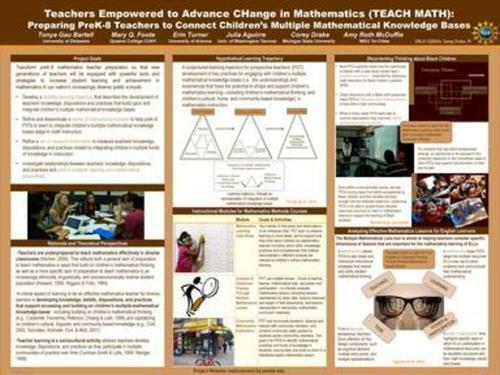 Project description: This project is designing, implementing and studying a curriculum that prepares preservice elementary teachers for equitable teaching of mathematics that encourages all students to share their mathematical thinking. The program increases the mathematical knowledge of preservice teachers and helps them recognize and implement equitable instruction. The preservice teachers are learning to recognize equitable practices by using the Mathematical Quality and Equity Observation Protocol (MQE) to assess teaching as viewed in video cases. The program includes mini courses of one hour that are spread throughout the program, ending just prior to student teaching. 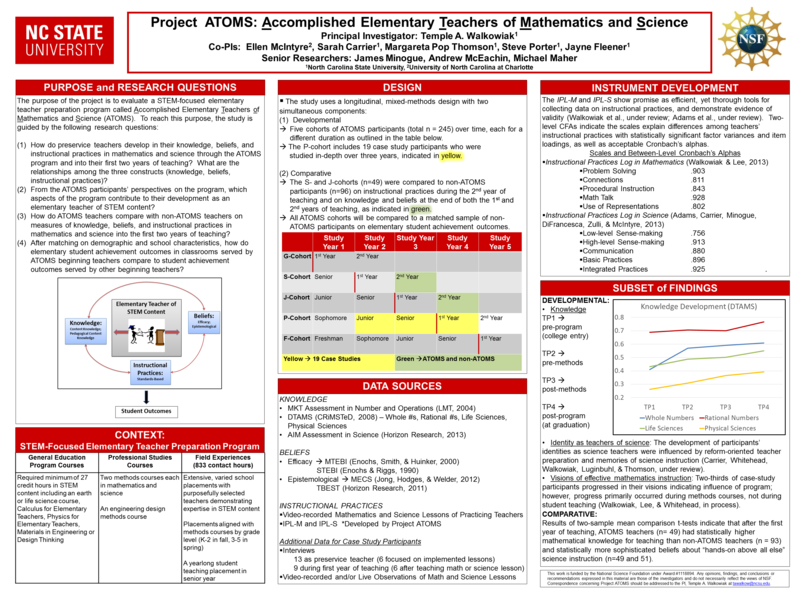 Project description: This project is studying the impact of the mathematics and science intensive preservice preparation program for elementary school teachers at North Carolina State University called the Accomplished Elementary Teachers of Mathematics and Science (ATOMS). The project includes assessments of preservice teachers' math and science content, teacher performance, self-report surveys, and teacher interviews. Researchers are also tracking participants' perspectives on the program and comparing knowledge dimensions and teaching performance of a sub-sample of ATOMS teachers to a similar group of non-ATOMS teachers. Each of the study dimensions (Knowledge Dimension, Teaching Performance, and Perspectives on the Program) will be assessed at three time points across this longitudinal study, providing a model for elementary teacher development of STEM teaching. Project description: This project aims to develop, implement, and study an experimental model of secondary science preservice teacher education designed to prepare novice school teachers to provide effective science instruction for English language learners (ELLs). The project incorporates the principles underlying the Next Generation Science Standards with a focus on promoting students' scientific sense-making, comprehension and communication of scientific discourse, and productive use of language. It articulates theory and practice related to the teaching of science content and the development of English language and literacy, and provides teachers with models of integrated practice in video cases and curriculum units. Project description: This project will modify the teacher preparation program for preK-8 teachers. The program is designed to help preservice teachers learn mathematics well, learn to access students' cultural funds of knowledge, and learn to encourage students' mathematical thinking. The developers are designing (a) modules that can be used in teacher preparation courses, (b) a mentoring program for new teachers, and (c) on-line networks to facilitate collaboration among participating teachers and institutions. The project includes a study of how preservice teachers learn to apply the knowledge they have gained in the program through a longitudinal collection of data that will track the preservice teachers into their careers.